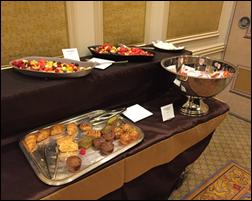 My last day at HIMSS kicked off with a pit stop for breakfast in the press room, which was refreshingly free of sugar-filled pastries (or perhaps they were just all gone by the time I got there). The Sands was decidedly quieter than Tuesday and Wednesday, with more than a few attendees exhibiting that glazed-over look that comes from too little fresh air and sunlight, and too much caffeine and alcohol. Many female HIMSS-goers wore purple in honor of International Women’s Day, which, according to the IWD website, is an homage to the purple, green, and white worn by members of the Women’s Social and Political Union in the UK in the early 20th century. Purple represented justice and dignity, green hope, and white purity. Today, the color purple reflects the day’s goal of celebrating women’s social, economic, and political achievements and the need for gender equality. 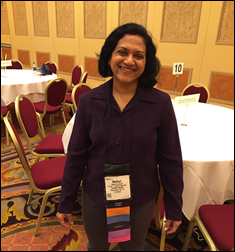 Madhuri Kudrimoti, director of clinical informatics at Froedtert & Medical College of Wisconsin, proudly sported the color during the morning’s Mentoring Meetup, which paired over female 100 attendees with table moderators to discuss topics like work/life balance, networking, and salary negotiation. I had the chance to chat with Kudrimoti about her organization’s health IT needs before the meetup got into full swing. Froedtert recently hired its first chief analytics officer – a woman, no less – who has tasked Kudrimoti with looking for analytics solutions that can help their organization aggregate their four or five data warehouses into one. Analytics are part of a five-year strategy Froedtert has just started to embark upon. Karen Marie-Wilding, table moderator and senior director of quality and value-based care at The University of Maryland Medical System, was quick to tell me that E&M (evaluation and management) coding needs to be retired when I asked her what topic or theme seemed to be prevalent at HIMSS. “Provider documentation needs to change in a big way,” she added, telling me that topic had come up in nearly every session she attended. Nuance solutions seemed to have also generated some buzz among her documentation circles. 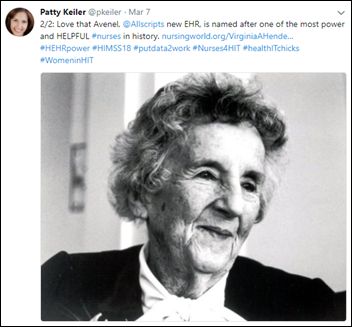 Fun fact on IWD: The name of the new Allscripts EHR, Avenel, does in fact have a story behind it (despite booth reps telling Mr. H it had no known provenance), as the tweet above can attest. I didn’t see much purple as I made my way into the exhibit hall. Trick shots from Chef Anton (who was in fact a chef) were in abundance at the Iatric Systems booth, though. Just after I snapped this pic, the man on the pool table reached into his pocket and grabbed his phone for a selfie. 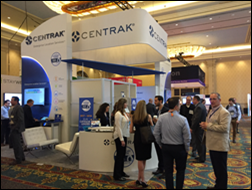 RTLS vendor CenTrak seemed to have decent traffic for the last day of HIMSS. 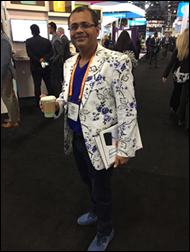 Clinicspectrum CEO Vishal Gandhi always looks sharp on the show floor. He had on a different but equally eye-catching jacket every day of the conference. The LogicStream Health team is always welcoming when I stop by. 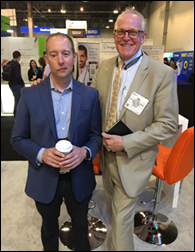 This time around I got to meet founder and CEO Patrick Yoder, who happened to be chatting with friend and former colleague Ray Wolski, VP of strategic solutions at Wolters Kluwer. 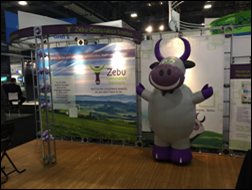 Zebu Compliance Solutions had a friendly blowup of the South Asian domestic cattle the company is named for. 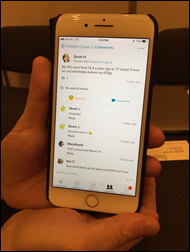 I had a great conversation with the folks at Fitbit, who showed me some of the compelling ways its users are sharing their personal health success stories using the new social sharing feature on its app. A first-time exhibitor, the company was touting its recent acquisition of Twine Health and the deeper dive it hopes to take into health management. 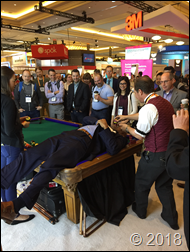 By the last day of HIMSS, I’m pretty immune to booth stunts, but the get-up above definitely got my attention. 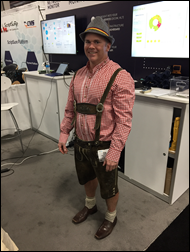 Paessler System Engineer Greg Ross donned his lederhosen to attract attendees to the German IT infrastructure monitoring company’s booth, and it seemed to work given the regret he had over not wearing the outfit Tuesday or Wednesday. While vendors were scurrying out of the shuttered exhibit hall, I headed over to the session on physician suicide and clinician engagement tools presented by psychotherapist and StelliCare CEO Melissa McCool and Lifely Insights Chief Strategy Officer Janae Sharp, who shared a very personal story of her physician husband’s suicide several years ago. Between 15 and 20 hands went up in the audience when Sharp asked who had known a physician that committed suicide, and nearly everyone acknowledged knowing someone that had attempted or committed suicide. Health IT came up, of course, but the ladies emphasized that EHRs and the like aren’t as much of a contributor to physician burnout and suicide as headlines would have us believe. Data from KLAS backed up their point. Solutions offered include changing licensure requirements so that mental health issues don’t have to be reported for re-licensure – a change that would hopefully result in MDs being more likely to seek proactive help, less burdensome interactions with EHRs, less burdensome federal regulations, and offering physicians more coping tools and support (like mental healthcare via telemedicine) without any stigma attached. One sobering session led into another, with my last of the day – Lessons Learned from the Boston Bombing – proving to be my absolute favorite. Former Boston Chief of Police Dan Linskey took attendees through the day of the bombing, showing video footage and playing audio to help us understand the way in which emergency services from all sectors of the city came together in a crisis. We laughed, we cried, and we finally gave him a standing ovation. 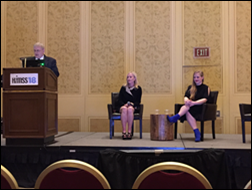 It was a far more compelling session than any HIMSS keynote I’ve ever seen. 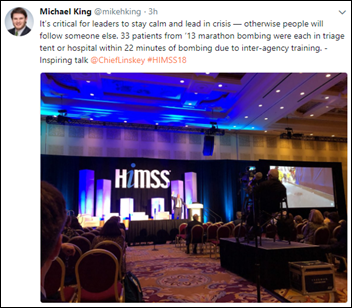 I couldn’t help but think HIMSS-goers would have been more inspired by Linskey’s experience and lessons on strategic planning and leadership than any tune from a Voice contestant or buzzword uttered by Eric Schmidt. I took one last walk through the Venetian and called it an early night. Thanks to everyone who stopped by our booth. Your words of gratitude and encouragement keep us going year round. HIMSS18 is in the books. See you in Orlando for HIMSS19! You are spot-on about the Boston session. That was the best HIMSS session I have ever seen. I also told a colleague that it should have been a keynote session, not a 5:30 evening session. Maybe next year?? Thanks for highlighting Dan Linskey’s session. I was huddled out in the Boston suburbs with my kids on those awful days – but last Thursday evening I felt as if I was standing next to Linskey – heart racing – listening to “Channel 1” in the middle of Boylston street. I cannot recall a more emotionally immersive experience. I will wonder all year how it is that I stumbled upon that talk at 5:30 – bleary-eyed as I left the exhibit floor.